Farhad Reza was born 16 June 1986 in Rajshahi. He is a Bangladeshi cricketer who made his ODI debut against Zimbabwe in July 2006 and is the only batsman from Bangladesh to score a half century on debut. He is a right-handed middle order batsman and right arm medium pace bowler and played domestic cricket for Rajshahi Division from 2004 until 2008. Initially Reza was not being picked for the national side by the selectors and Bashar insisted during the tournament that he could have used him. In July 2006, following a successful 2005/06 domestic season when Reza was leading run-scorer in the Bangladesh domestic league, he was selected in the 15-man squad to tour Zimbabwe and Kenya. He made his One Day International (ODI) debut on 30 July 2006 against Zimbabwe in the second ODI of a five-match series. Coming in when the score was 73/4, Reza scored 50 from 57 balls, guiding the team score to 147/6. Find Farhad Reza profile and stats of batting, bowling and fielding including latest updated news of Farhad Reza, videos and images at Hamariweb.com. 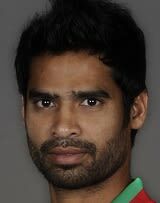 Also find detail Player profile and career statistics of Farhad Reza of Bangladesh. Farhad Reza - Find Farhad Reza of Bangladesh Cricket Team complete player profile, number of matches, runs score, wickets & catches, Statistics, Records, Farhad Reza Latest News, Farhad Reza Videos, Farhad Reza Photos, and other Farhad Reza Cricket Team players.